What do I think of Paul Copan’s book on everyday apologetics? Let’s talk about it on Deeper Waters. A friend of mine told me about getting this book as a Christmas gift and asked if I’d like to read it and see what I think. Now I do know Paul Copan and see him as a friend and I’ve liked all of his other books that I read and so I jumped at the chance. As expected, I was not disappointed. 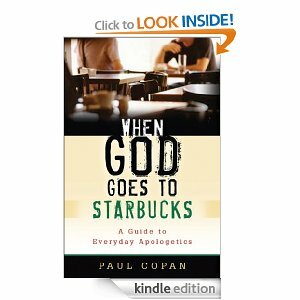 Copan’s great strength is in so many of his books that he writes that are conversational and deal with issues that will pop up at a location such as Starbucks. In this volume, you’ll find issues such as the question of egoism, lying to the Nazis, the redefining of marriage, the Canaanite conquest in comparison to Islamic Jihad, if Jesus was wrong about His second coming, and the problem of so many denominations. Copan lays out the case each time and then concludes with a summary of the issues. When that’s done, he’ll point to other works that are worth reading, many of them the works of scholars in the field which is something that I greatly appreciate. Copan’s writings are meant to be a starting point for further study with enough to show you where to go next. I was pleased also to see him talking about the importance in the book of the honor and shame dynamic in the Middle Eastern culture and how we misread the Bible because of this. This is the kind of idea I wish would catch on like wildfire among evangelicals, but alas, as evangelicals too often are ignoring scholarship and sticking to a Western worldview, we are disappointed. It is one of the reasons that we have so much fundamentalism in the world today, including the way atheists respond to the Bible in assuming a Western context. Also refreshing was to realize that Copan takes a Preterist viewpoint in answer to the question of the second coming of Christ. This is also a view I hope to see grow in the evangelical movement. Copan’s chapters on the question of the return of Jesus will no doubt cause great shock and concern among many Christians, as such an idea did for me when I was first looking into the problems of a dispensational viewpoint, but in coming to a Preterist view, I found a view that I hold has a more comprehensive explanation of Scriptural passages and speaks in the language of Scripture far more. The only chapter I really thought could have used some more was the last one on the denominations in the church. There was no mention of the claim that there are x thousand denominations in the world today, with a number that seems to keep rising. Most people don’t realize this is an entirely bogus statistic and I would have liked to have seen more on that front. Still, in a book like this, that that is my main concern should speak plenty about how excellent the rest of the volume is. This is a book I would gladly put in the hands of the layman today who is dealing with some of the issues that are being talked about. I consider Copan to be an excellent apologist and worker in the field and hope to see more books like this increasingly from him.